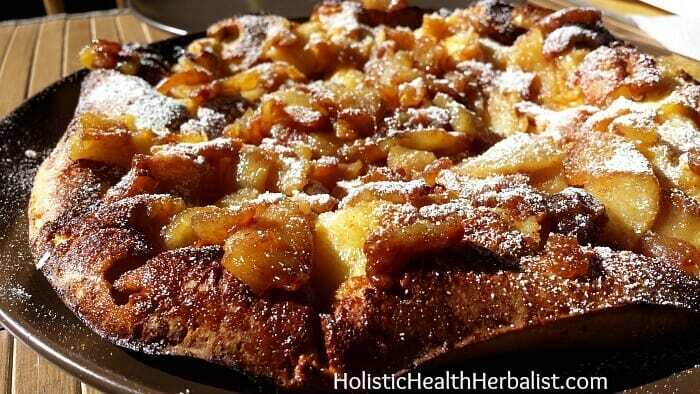 This German pancake recipe is quick and simple to make with just a few ingredients. They’re actually one of my most frugal recipes as I almost always have everything I need on hand whenever I feel like making them. My boyfriend and I like to make these together on Saturday morning with whatever fruit that needs using. Our favorite fruit (and the easiest!) 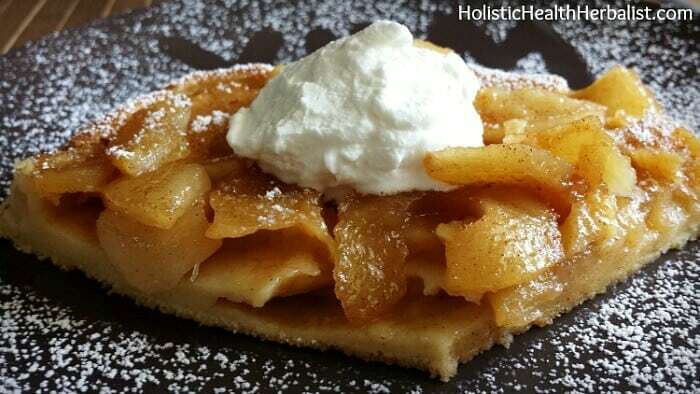 are sweet apples as they lend a nice texture and flavor to the dish. Dolloped with freshly made whipped cream and a sprinkling of powdered sugar and you’ve got yourself a real treat. No need to tell me that these aren’t healthy because they’re not supposed to be! These German pancakes come straight from my grandmother’s recipe box and I plan to keep them this way as their flavor remind me of her and all the time we spent together in the kitchen. So make ‘em if you dare, cuz you might just get hooked. Also, feel free to tweak the ingredients to suit your needs though the true flavor will not be the same. Alright, so let’s get to it! 1. First things first, preheat your oven to 425 degrees. 3. Mix the flour , sugar , and sea salt together in a large bowl. 4. In another bowl, whisk the cream, eggs, and vanilla extract together. 5. Now pour the wet mixture into the dry mixture and whisk until the batter is smooth with no lumps. Set aside. 6. Next, melt some butter in an ovenproof skillet (a seasoned 10-inch cast iron works best) over med-high heat. 7. Add the apples to the skillet along with the brown sugar and cinnamon . Sautee until golden then remove from the heat and add the fresh lemon juice to the apples. Stir to coat evenly. 8. Now, here’s the important part! Pour the batter around the edges of the skillet THEN over the apples. You want to make sure your final product has delicious crispy edges. 9. Immediately put the skillet in the oven and bake for 15-18 minutes. During baking, the edges will rise A LOT. Don’t worry, this is normal and believe it or not, the batter will not spill over the edges. Once the German pancake is golden brown, remove it from the oven and gently loosen the edges with a spatula. Flip the pancake onto a nice big plate (this can be a little tricky but you ca do it!). Dust with powdered sugar , a dollop of homemade cream, or drizzle with homemade syrup. 1. In a stand mixer (I LOVE this one ), add 2 cups of cold heavy cream and 2 tsp (more or less) to the mixer. You will need the whisk attachment for this to work. 2. Begin on low for a few seconds, and then turn it up a little higher than mid-speed. 3. Whisk until the cream forms stiff peaks. 4. Keep cold until ready to serve. [yumprint-recipe id=’35’]Crispy, sweet, tangy, DELICIOUS. These are sure to become one of your favorite pancake recipes. What is your favorite type of pancake? I’d love to try them!